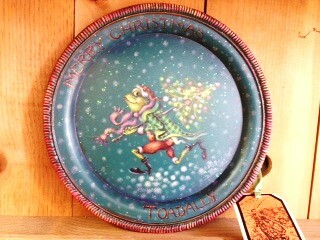 This whimsical tree frog is designed and painted by Bobbie T. on a 10" round metal tray. The price is $225.00 (CA. residence pay 9% tax) + shipping & handling. Shipping in the USA and foreign countries is by USPS Priority Mail.